My infusion set decided to die and tucker out early. I diligently put in a new site when I got home from class including a new pump battery after fighting to get the battery cover off for nearly 10 minutes. I finally went downstairs and had to use a pliers to loosen it. How did it get so tight? I have no idea. Diabetes really tries one’s patience in multiple ways! 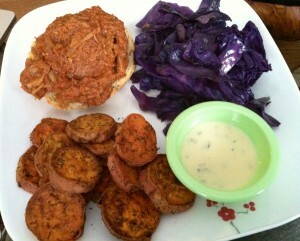 I ate a healthy lunch of one piece of bread topped with shredded BBQ chicken, homemade sweet potato fries and cooked red cabbage. I then spent a few hours in the kitchen making a homemade vegetable quinoa soup followed by an attempted nap. I got woken from my nap late afternoon with my CGM alarming and telling me my blood sugar was 315 going double arrows up. 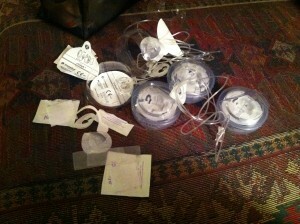 I jumped out of bed and ripped out my infusion set to have a drop of blood appear. The reason for my high. (Yes, doctors say that hitting a blood vessel with an infusion set will not cause a high but this has NOT been my experience). I put in a new infusion set, took a shot (not through my pump) and laid back down for my nap again. Do any of you experience highs when you have inserted your infusion set into a blood vessel too? I hit blood vessels with my sites way too often. 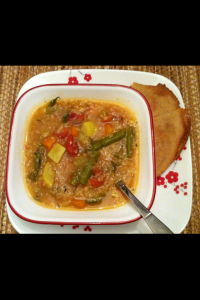 For dinner I ate a bowl of soup and one gluten free pita. I then hopped on the treadmill for my walk. 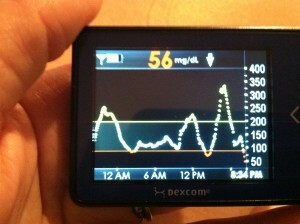 After only 16 minutes of walking my Dexcom CGM reported a bg of 84 with double arrows down. I got off of the treadmill to test and was greeted with a 56 on my meter. After 20 minutes and 6 ounces of juice I was just 74 so I took another 4 ounces of juice. I am 101 now with double arrows up on my CGM. Why am I frustrated? Because today I did everything right. Healthy diet, yoga, the start of a 3 mile walk and rest. This is why living with diabetes can feel like you are banging your head on a wall. Despite doing everything right, there are still so many ways for blood sugars to fail and be out of range and leave you feeling down in the dumps. Wiped out. This is why we need a cure. This is why we need to tell our stories. I probably did better self care today than the people without diabetes that frustratingly ask me when my sugar is high or low what I did wrong to cause it. Arghhh! You see, that’s it! I did NOTHING wrong to cause this. This is the nature of the disease. You can do EVERYTHING right and then some, and still get bombarded and slapped over the head a dozen times from this darn disease. Bad day with diabetes? YES! Days like this that are full of roller coasters of not fun. I just have to wonder how those of us who live with diabetes do it. How do we keep plugging away like this despite this pain in the a** disease that is so entirely uncooperative despite our best efforts sometimes? I can’t speak for anyone else. But as for myself, I believe this is why I have gotten really good at pushing away the negative stuff in my life. Not really seeing it. Sound harmless? It’s not. You see, it takes a healthy person to feel and accept the impact of a problem in their life to create change. By becoming masters at pushing things under the rug that bother us (namely DIABETES!) we are really good at ignoring in our life what might need attention and help us to feel better if we were only to address it. How can this affect us? These feelings and emotions can start coming out through our bodies as symptoms if they are not dealt with. I am still trying to get better at facing problems in my own life. But I gotta ask myself. If I really was to face the full impact of what happened today, how many times I got bombarded by absolute diabetes frustration and silliness, how would I be? Would anyone want to spend time with me? How many days would I be moping around if I was really to face the reality of what I and each of you go through each day with this condition. Yes, I am alive and I am thankful. But sometimes it is really unreal what all we put up with. And when it happens on a day we are doing everything right, it is just all the more difficult to chew and swallow. After all, if we eat pizza or a special treat from the bakery and get high we can accept part of the blame. Days like this, I did NOTHING wrong yet still get kicked in the face. I think this calls for one of the diabetes poems I wrote this fall or maybe a new one. Please share with me. How do you cope (or how do you as a parent and/or your child) cope when days like this come around? We all know we cannot as hard as we might try, prevent days like this from happening. Are we really allowing ourselves to feel the impact of what has happened or are we stuffing the feelings and tucking them away somewhere deep inside of us? And what does this do for us emotionally and physically in the long run? Depression is common in diabetes—days like today with this condition are a good example of why. Are some of the people with diabetes who live with depression just allowing themselves to truly feel the reality of their existence with this disease while the rest of us walk around pretending like everything is okay? I will close this for now. But I’d love to get a great discussion going. How do you cope with days like this? And do you allow yourself to feel all of the negative emotions that arise from living each day with a grueling condition like diabetes? ps. Just when I thought I had enough.. Last night at bedtime I jumped up to over 300 again. I thought it was because I took too much juice and didn’t end up walking on the treadmill for very long. Nope. I was in a blood vessel again. And it took two more infusion set insertions to find one that was hopefully not going to be in a blood vessel and cause serious highs. (The 4th site of the day yesterday was a charm – Yippee!) Just when you thought you had the most horrible day possible with diabetes, it can get worse. 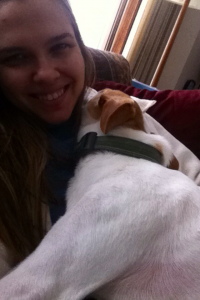 Fortunately when I woke up this morning, I was greeted with an especially cuddly dog. This made a good start to today and was much needed. 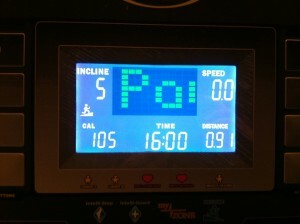 About to hop on the treadmill now and will hope for better results! As I read your post, I’m eating extra glucose and calories in an effort to get my blood sugar hight enough so I can go work out at the gym (it’s currently 79). With all the extra carbs one has to ingest before and after a workout, you wonder if you are just breaking even with calorie burning, and if it’s worth the effort at all. Point is, I get what you are talking about; the days you put in a lot of effort to manage your diabetes and have the outcome that you had. One thing I’ve learned about T1 is that effort rarely equals outcome. It’s better on days that I “cheat” and make poor eating decisions, because at least I have something to blame it on. The fear sets in when you do everything right and realize you still can’t control it.